BEFORE USING THIS PRODUCT, READ, UNDERSTAND, AND FOLLOW THESE INSTRUCTIONS. Take special note of the Safety Guard & Tips and Tricks sections. What it is! This opener is designed to open plastic hard shell packaging, plastic clam shell packages, some other types of plastic packaging, and paper envelopes. It is as easy as pressing a button. You simply press the button and guide the Zip-it around the edge of the package or envelope. There are no rough or sharp edges left to worry about. The Zip-it Opener is powered by two AA batteries (purchased separately). To install the batteries, lift the top of the handle off and place the batteries in the proper direction. NOTE: Should the performance become erratic, replace the batteries as this is an indication of a weak or expired battery. It is advised to remove the batteries when the Zip-it Opener is not in use for extended periods of time. What it is not! This device should not be used to cut anything but plastic clam shell packaging and paper products. It is not to be used on metal, wire, cans or any other solid or hard material. Safety Guard: It is often necessary to remove the tinted plastic cover over the roller blade to cut the edge off the hard shell plastic packaging due to their shape and size. Use extreme caution in this process as the blade is sharp and could cause bodily harm. The guard is removed by rotating it in a counter clockwise direction and lifting it away from the Opener. It is replaced by reversing this process. 1. Slide the edge of the package into the gap in the front of the tinted plastic cover until it reaches the roller blade. 2. Press the button to activate the roller. 3. While holding down the button, press forward away from you along the edge using light pressure to guide the rotating blade as it cuts into the plastic packaging. You must guide the direction the Zip-it cuts. See illustration below. 4. The same process applies if you have removed the protective cover for better access. 1. The Zip-it Opener can be operated by hand in the event the batteries are spent. This is not as easy, but is made somewhat easier with the help of a friend. 2.While proceeding as described above, have someone turn the spindle on the side of the opener to turn the blade. This method is not recommended, but it does work. We have found that when the package has deep wells or grooves around the edge, it is helpful to remove small amounts of the edge at a time with the protective guard taken off. This eating away of the edge will often allow you to open the package. We have also found on these deep welled packages, the corners present the biggest problem. If these corners are deep enough, the Zip-it can get ‘trapped’ and not move. Our recommendation is to cut into the sides avoiding the corners. 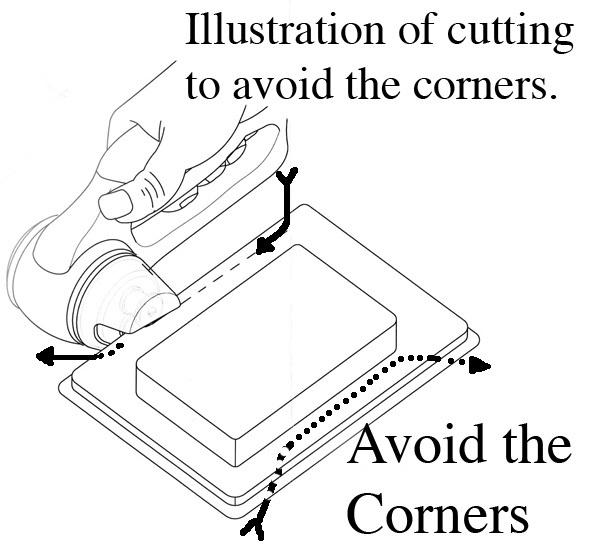 Once the sides are trimmed, it is possible to flatten the corners and trim them off. Please click for an instructional video. questions. Our service team will answer your questions, advise you on usage, or help trouble shoot a problem. If your product needs warranty service, we will help you obtain the fastest remedy possible under the warranty. CAUTION: Always handle the Zip-it Opener with care. Read all instructions before using. This product is not a toy. Please keep it out of the reach of children. disposed of and recycled in compliance with all applicable laws. For detailed information, contact your local solid waste authority. This item is warranted to be free from defects in materials or workmanship for a period of 60 days from the original date of purchase under normal conditions of intended use. Operation of this product in a manner inconsistent with the instructions given in this manual may result in personal injury and/or damage to the product and will void the warranty. Within the warranty period, we will repair/replace the product or refund your money, at our option, through our facility in Walla Walla, Washington with proof of purchase. Return postage is not covered by this warranty. This warranty extends only to the original purchaser, and excludes any damage to the product resulting from accident or misuse. The product is not warranted when used in a commercial or business environment. The above warranty is complete and exclusive. The warrantor expressly disclaims liability for any special, incidental, indirect, or consequential damages in connection with the purchase or use of this product or costs over the original purchase price. Any implied warranties arising by operation of law shall be limited in duration to the term of this warranty. This warranty gives you specific legal rights and you may have other rights, which vary by jurisdiction. This warranty is valid only within the United States of America (USA). Zip-it Opener is a registered trademark of KARYL ENTERPRISES, INC.
Made in China exclusively for Karyl Enterprises, Inc.